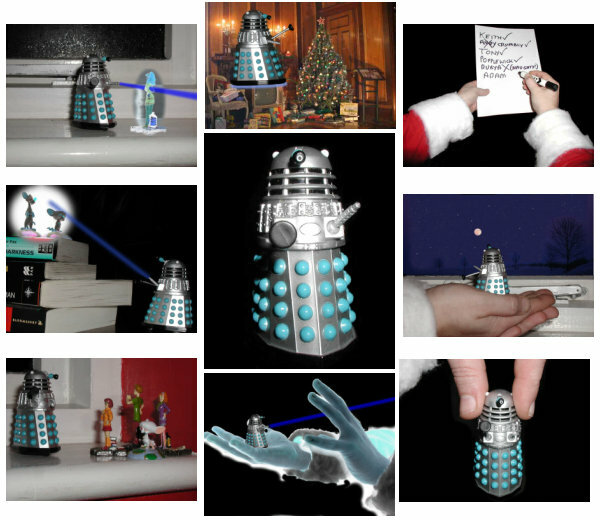 You can also listen to the Narrated Mr. Dalek's Night Before Christmas as an MP3 (7,201 KB). Mr Dalek was feeling quite pleased with himself. Devising a plan that was frankly quite shocking. With a wide range of toys, who for now were not there. "I'll exterminate you just as fast as I can. "You've hung up your stockings and don't they look cool. "Surely Santa will fill them with goodies this Yule. "But because you'll be zapped I'll just keep them for me. "Bwa ha ha ha ha ha ha ho ho ho he he." Well, to his annoyance they all ran and hid. He'd just have to hunt them - so that's what he did. Some toys hid quite well but some others did not. Once cornered, he exterminated the lot. And wizards and witches and goblin-y things. And now Golum didn't feel precious at all. Next up was Pinky, who hid with The Brain. They begged really well but got zapped all the same. And Daphne was next as he zapped off her boobies. And once he had cornered her, primed up his zapper. And jumped off the shelf lest he exterminate her. "Ha!" said Mr Dalek, "You cannot escape. "I've got flying skills and I'll catch you - just wait!" Taking aim with his zapper as Velma ran off. And went to find out who had gate-crashed his hood. Well it was Christmas Eve in a story, you know. Our Dalek went after the gate-crashing sponger. Stood one Father Christmas, his nose like a cherry. "You should be in bed because Christmas is near-o. "Have you left a mince pie and some sherry for me?" And screaming "Exterminate" zapped his reindeer. And Comet and Cupid and Donder and Blitzen. Then he turned to face Rudolph and zapped him and all. "Oh dear," said Santa, "You've blown up my crew. "There really won't be any presents for you. "And now I'm stuck here with a sleigh that won't fly. "But now I'm so cross I will just take them back." New toys in the sack? He was happy and felt it. He needed new friends now the rest were all melted. To chase them around and to exterminate. Apologised, although it made him feel sick. "I understand I should have stroked them instead. "And shouldn't be punished because I am bad. "I'd go please please please please please please please he he." Oblivious to Mr Dalek's guffaws. "I'll give you some gifts cos I'm such a nice chap." And he lifted his toy sack into his lap. A Thunderbirds ship and a cuddly Baloo. He hardly could wait to destroy all these thing-lies. Velma appeared and kicked him in the balls. "You meant to be decent, after a fashion. "You would have zapped me if I hadn't said Jinkies. "I don't even know what has happened to Scooby." She shouted "Hiya" and kicked him off the roof. The snow broke his fall but it really was chilly. The whole world would know he'd been beat by a girl.